Slater Smith, Jr. of Raleigh, NC and formerly of Sherborn and Sudbury, MA died peacefully in the presence of his mother, father and sister on October 1, 2017. 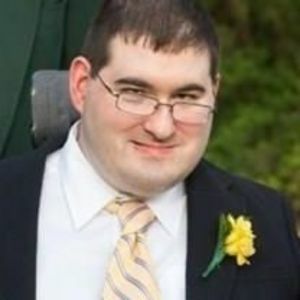 While living with the challenges of cerebral palsy and being wheelchair bound all of his life, Slater brought a special kind of joy and humor into the lives of those lucky enough to be touched by him. At the forefront of special education legislation, he was involved in starting a number of community schools and was always taking part in outreach programs and speaking to the public about living with disabilities. Acting, music and watching sports were of particular interest. As a participant, he took part in wheelchair games and spent a few memorable winters involved with a disabled ski program where he could be seen navigating Loon Mountain on his bi-ski in subzero temperatures. His participation in the Pilgrim Church youth group had a lasting impression on both Slater and his fellow youth group members. Slater was proud of his involvement in the Michael Carter Lisnow Respite Center in Hopkinton, MA and of his many years volunteering with the Ashland Animal Hospital in Ashland, MA. Two years ago, Slater moved to Raleigh, NC to be closer to family and enjoy a warmer climate. During his time in North Carolina, he captured the hearts of many at the Litchford Falls Nursing home, participated in several road races with Ainsley's Angels and found a true family in the Christ's Sanctified Holy Church. Slater was in control of what he wanted until the very end. He was caring, calm, courageous and he is now at peace. Slater is survived by his father Slater Smith, Sr, mother Suzy Nichols Smith, sister Corey Riley, brother-in-law Shawn Riley and two nephews, Colin and Adam Riley. A service was held on October 5th at Christ's Sanctified Holy Church in Raleigh. In memory of Slater contributions to the Lisnow Respite Center in Hopkinton, MA, Christ's Sanctified Holy Church in Raleigh, or Ainsley's Angels North Carolina Central Carolina group would be appreciated.